These pictures are of puppies born here at Powder Valley Poodles. They show what the puppies will look like as they get older. This is especially helpful if our “Available Puppies” page shows only newborns. Some of these pictures show puppies with shaved faces. We will shave a puppy’s face, feet and tail (called a “puppy clip”) if the new owner desires. We recommend it, as the sooner the puppy gets used to being professionally groomed, the easier the process is. As a former professional groomer, I know it will be appreciated by anyone given the task of grooming your new puppy. 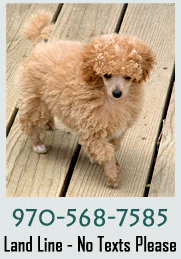 Poodles of all sizes from Powder Valley Poodles. We offer toy, miniature and standards — both small and large.